Popular comic strip, Kikomachine Komix soars high as many readers can relate to its humor and stories of Pinoy moments. And in their 4th year of honoring Pinoy cartoonists, Solo tributes their newest collection to award winning artist, Mannix Abrera in their comic based collection. 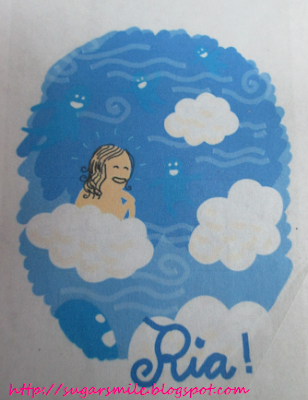 If I were a Kikomachine character, Manix described be as this, floating with the clouds. Sugarsmile talaga! I have met Manix last year during one of the events I attended and despite his fame, he was humble and quiet. A graduate of Fine Arts major in Visual Communication in UP Diliman, he started writing Kikomachine when he was still in 2nd year college back in 2001. His inspiration: his university life and what was happening around him. This clearly depicts how writers tell about writing what you know. In his case, it's drawing you know and making your readers relate to your story. Now with 9 books, Kikomachine continues to make Filipinos laugh everyday through his craft. Solo's 4th year of Pinoy Cartoonist Memorabilia features a bunch of nameless University kids as main characters of KikoMachine Komix. The collection consists of men and women’s casual wear - from tees, collared tops and shorts, all incorporated with graphic images of the humorously drawn characters and eccentric comic strip scenes. Reader or not, you will be able to enjoy the fun and eye-catching prints of this Pinoy humor in fashion. So get set as Manix Abrera’s Kikomachine collection takes the centerstage and hits Solo stores this August! 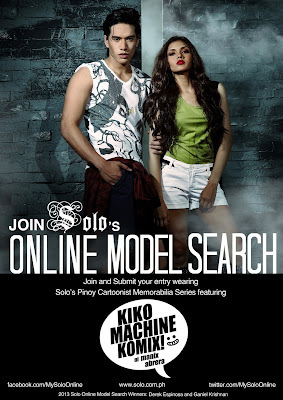 Aside from the newest Solo Kikomachine Collection, Solo launches the 2013 Online Model Search. This is your chance to become the latest face of Solo's apparels. Started back in 2009, 100 model poster entries are submitted to Solo's site, which allows viewers to vote for their favorite model and this is your moment to be one! The 2012 grand winners, Ganiel Krishnan and Derek Espinosa, both had the chance to play out their modeling dreams with last year’s Online Model Search featuring Tonton Young’s Pupung. Past featured collections include Tony Velasquez’s Kenkoy, Larry Alcala’s Slice of Life. Solo's much awaited modeling competition starts on August 15. Contestants, male or female, should submit photo entries of themselves modeling one (1) item from Solo’s Pinoy Cartoonist Memorabilia Series featuring Manix Abrera’s Kikomachine while adhering to the theme: Street Life. Photo entries must also include at least one of the design elements found in the design pack which contestants can download at solo.com.ph. Contestants must then log on to Facebook and upload their entries, all of which will be screened by our moderators, through the Solo Online Model Search App/Tab. Entries can be submitted until October 15 but voting of all approved entries will last until October 27. The contest is open to Filipino citizens at least 16 years old. Contestants below 18 years old must submit a parental consent form before joining which they can send via e-mail. Remember to focus on creativity, photo layout and styling! After the contest period, 20 finalists (Top 10 males and Top 10 females) will be chosen and invited for an interview. Solo is on the hunt for one male and one female with the most photogenic appeal and the best personality fit for representing the brand. 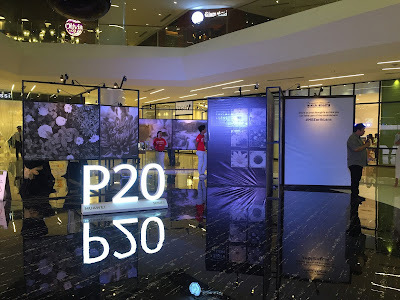 These two individuals will be deemed as grand winners by our panel of judges and will each win cash prizes, gift certificates and of course, bragging rights as they see their images in all Solo stores! Their partner photographers/graphic artists will be receiving cash prizes as well. 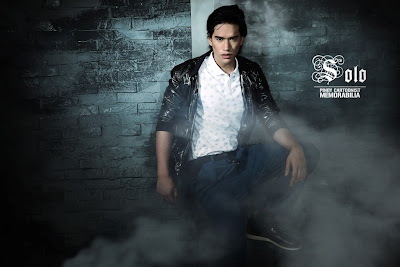 Model grand winners will also get the privilege to do two photoshoots for Solo’s 2014 campaigns with one of the best photographers in the business, Doc Marlon. Claim the chance to be known in the fashion industry and be the next face of Solo! For complete mechanics, you may log on to solo.com.ph or like their Facebook page at facebook.com/mysoloonline. You may also follow them on Twitter and Instagram with handler @MySoloOnline.